Ruffled Top. Jeans. Bag. Heels. 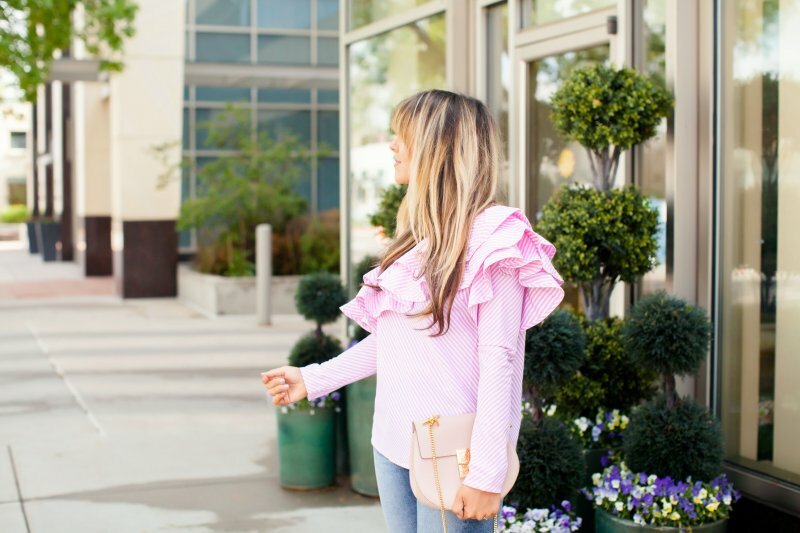 This top is probably my favorite at the moment because of the feminine, statement-making ruffles! I don’t usually buy into trends, but I am loving the ruffle trend right now. And I don’t see it going anywhere anytime soon; fall looks are all about statement sleeves and ruffles. I wore this to wine night with a few friends recently and it was the best girls’ night top. I thought this top would scare my husband off, but when I put it on for a date night he actually complimented me on and said he thought the ruffles were really pretty. And when my guy likes an item just as much as the girls, I know I’ve made a decent shopping decision. And speaking of shopping, some fellow bloggers and I have teamed up to give away a $1,000 Nordstrom gift card! Just in time for the Nordstrom Anniversary Sale to become available to the public this Friday. So… Enter the giveaway on my Instagram post HERE and be sure to check out my Nordstrom Anniversary Sale post HERE. Fit Details: Go up one size in the top as the sleeves run a bit small. Jeans run true to size. If you’re in between measurements and have a bigger waist, you might want to go one size up since these are high-waisted. Shoes run true to size and are so comfortable. The bigger the ruffles the more I am in love!! Super comfy and stylish look! Love the top! You look gorgeous!